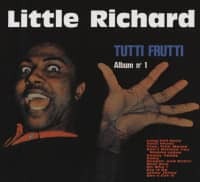 •	Little Richard’s mid-sixties comeback album, augmented with several masters previously unissued on vinyl. •	His most frantic recordings besides his classic hits from the 1950s and most likely the best LP album he ever recorded. •	Little Richard was ranked world's #1 Rock 'n' Roller by both, Lemmy of Motörhead and John Lennon of Beatles fame. •	Essential 1960s Northern Soul classic, originally released in early 1967 on OKeh Records. •	Includes Get Down And Get With It, later a glam rock smash for Slade. 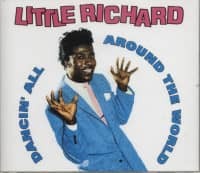 •	Produced by Larry Williams and Johnny ’Guitar’ Watson. •	DeLuxe 2-LP set with gatefold sleeve, new liner notes and previously unpublished photos. •	Pristine sound quality, carefully re-mastered for 180gram vinyl release. •	Original LP album plus bonus 12“ 45RPM album containing original non-album tracks and outtakes. 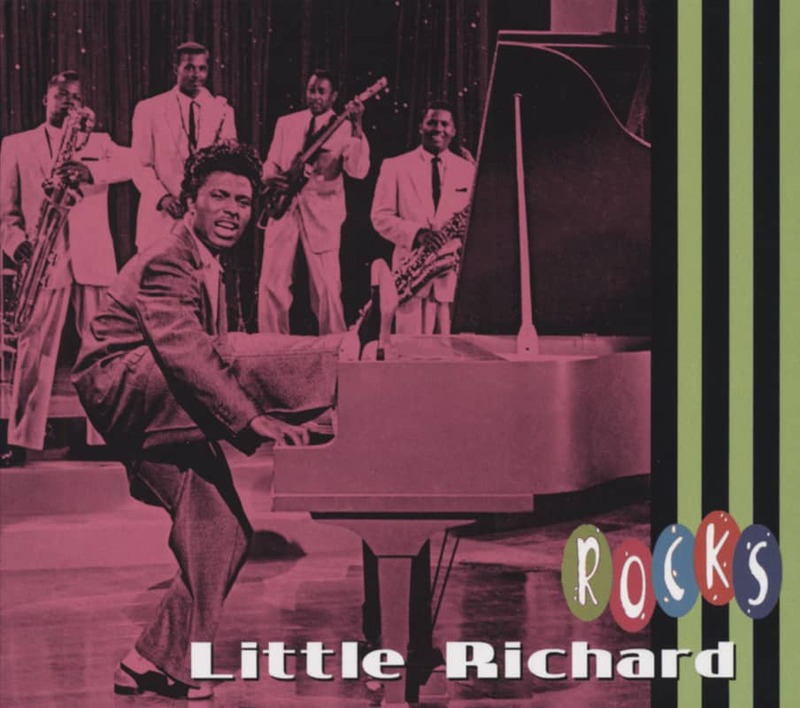 Little Richard is regarded one of the wildest and most frantic rock ’n’ rollers, ever. 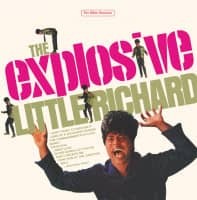 ’The Explosive Little Richard’ is his mid-sixties comeback album and his first LP under the label of the revitalized Columbia subsidiary, OKeh. 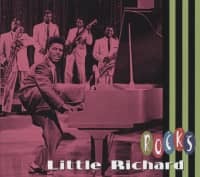 Produced by Larry Williams and Johnny ’Guitar’ Watson, it reflects the popular soul sounds of that time. 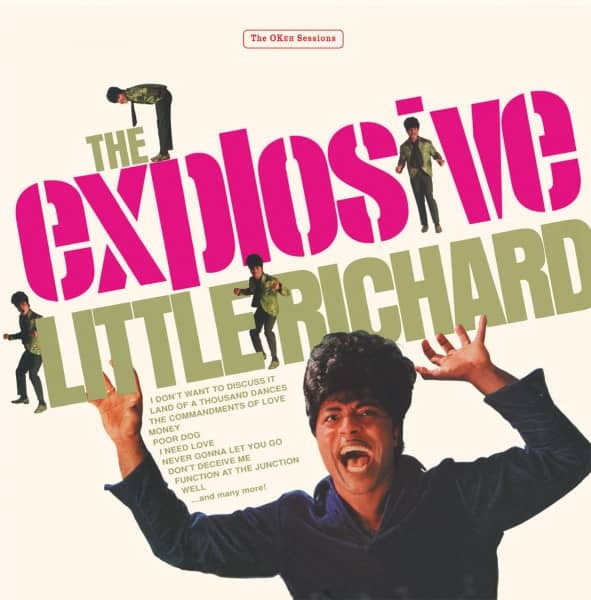 Little Richard had gone full throttle for the powerful Northern soul thang. This set contains some of the finest up-tempo Soul anthems ever recorded, including I Don’t Want To Discuss It, Money and Get Down And Get With It. Bear Family’s 2-LP DeLuxe set contains the original vinyl LP album (sides A and B), augmented with a second longplayer which runs at 45RPM containing outtakes, non-LP tracks and a late 1966 London session, all first time on vinyl. Previously unpublished photos and new liner notes by Chicago soul afficionado Bill Dahl are added for maximum explosivity! 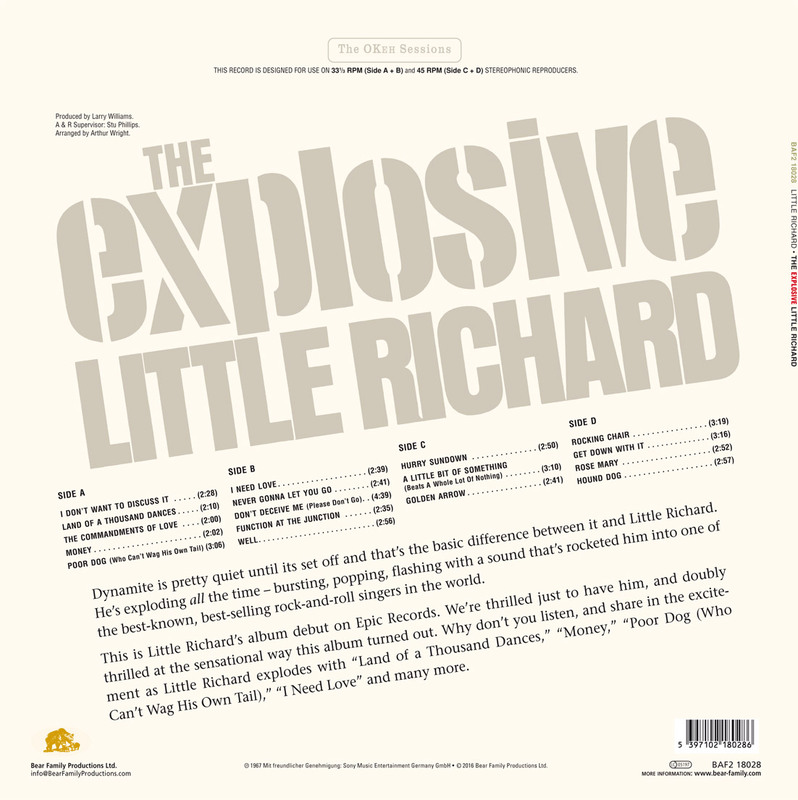 Customer evaluation for "The Explosive Little Richard! (2-LP)"
The Arts Desk, 18.09.2016	"The Explosive Little Richard! was great, and this a great way to hear it. At around £25, it’s priced about the same as an original in fair shape but the bonus album and pin-sharp mastering make it a must." 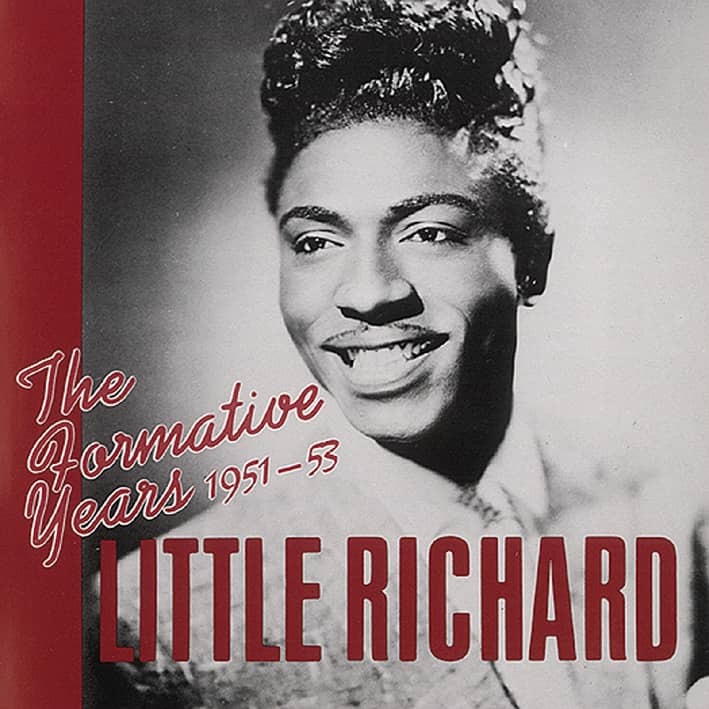 Essential Daily Briefing, 09.02.16	"This release also includes tracks Little Richard cut during a UK tour which saw him at Abbey Road, where, backed by top session men including homegrown guitar hero Big Jim Sullivan, he cut a stomping and superior version of a Bobby Marchan song “Get Down With It”, later appropriated by Slade. Still, this handsome reissue with a vinyl LP accompanied by a bonus 12in 45RPM album containing original non-album tracks and outtakes, shows us what could have been. Rolling Stone 9/16	"Exzellent gefertigtes Reissue mit Outakes auf einer Extraplatte." Good Times 4/16	"Das ist mal wieder so eine Granaten-Ausgrabung von Bear Family. Das von Larry Williams und Johnny Guitar Watson produzierte Klassewerk hat Bear Family nun perfekt in knackigem Stereo restauriert und zu allem Überfluss noch mit einem gescheiten Begleittext und vor allem mit einer schnellaufenden weiteren 30-Zentimeter-LP angereichert."